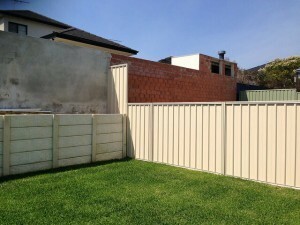 Colorbond Products - Why Choose Genuine Fencing Products? Considering buying generic Colorbond, rather than genuine Colorbond products? People are often drawn to imitation products, which is understandable. Whether it is clothing, shoes, groceries, or prescription medications, generic goods can be an attractive option because the cost is lower and an opportunity exists to save money. But, when you’re considering fences for your property, particularly Colorbond fencing, buying generic is a bad idea. So Why Genuine Colorbond Products? Colorbond, which is manufactured by leading Australian steel producer BlueScope, is made from high-grade, high-strength steel. Other companies, in comparison, use production materials that are inferior, resulting in fencing and building products that are far less durable. However, it’s not just about the materials that are used; it’s also about how Colorbond is made. The steel that is used to produce original Colorbond undergoes a special process that makes the product hardwearing, weatherproof and fire resistant (great for bushfire-prone areas). This involves coating the base with an anticorrosive metallic, applying a pre-treatment layer for coating adhesion and adding a specially formulated primer. A top coating of paint is then baked on to prevent flaking, chips and blisters and provide a long-lasting finish. Exceptional durability is one of the greatest benefits that Colorbond Australia offers. Though it was discovered in the 1840s that corrugated steel fences and roofs were incredibly durable, regular maintenance in the form of painting was required to provide this hardiness. 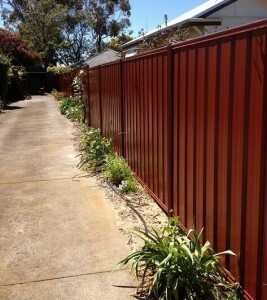 Because the colour is bonded to the fencing, no painting is required with Colorbond steel fences. Because it is going to cost you more in the long run. Possibly, a lot more. Generic Colorbond does not provide the strength, durability or longevity of the original product. This means that while you may be saving money on your fencing initially, you’re inevitably going to have maintenance costs. Before long, you may have to repair or replace your fence. Decades of development and research have gone into creating the technologies that make genuine Colorbond the trusted fencing product that it is today. Tested rigorously in both laboratory and outdoor settings, it is designed to withstand Australia’s unforgiving weather conditions, providing effective resistance against wind, dust, rain, hail and extreme heat and cold, and BlueScope backs their Colorbond steel with a generous warranty. The BlueScope warranty is good for up to ten years from the date that the fence is installed. It covers against corrosion, perforation, and natural wear and tear. It also covers the paint system against flaking and peeling. With generic Colorbond, on the other hand, there is no coverage (or very little), and there is little guarantee that your fencing will stand up to the elements. Genuine Colorbond provides better security and durability than cheaper counterparts and will generally last a lot longer, so while original Colorbond prices may be higher, the investment in quality will usually pay off over time. Inexpensive materials deteriorate faster. They are more prone to denting, rusting, fading and damage. This is why generics are not a good choice. Looking for genuine Colorbond products in Perth or Bunbury? In need of professional fencing advice? Contact Us to talk to one of our experienced team members today!